Lucas Perez has furiously hit out at claims he refused to warm up during West Ham’s win over Everton. Michail Antonio was sent on ahead of the Hammers striker when Marko Arnautovic picked up an injury in the 64th minute at Goodison Park. Carlos Sanchez was then preferred to the Spaniard when replacing Mark Noble just seven minutes later. Sky Sports claimed Perez, 30, had refused to warm up and cameras at the time showed the ex-Arsenal ace in a heated discussion with goalkeeping coach Xavi Valero. Boss Manuel Pellegrini played down any rift after the match. Perez insists he HAD warmed up and denies any suggestions of a bust-up, claiming images of his row on the bench were “misinterpreted”. He tweeted: “Given the false information spread by the media that has affected my image, I am obliged to explain the only truth: I have never ever refused to warm up in my whole career, let alone play a match. “In my current club the players on the bench warm up in a series of 3 to 5 minutes, in continuous rotation. “In the moment that Marko got injured, I was on the bench after warming up. “The coach called me to go out to play, however having realised that it was faster to substitute Antonio in, who at that moment was warming up he changed his decision. “The images that have been misinterpreted correspond to a talk with the goalkeeper’s coach, in which I never refused to warm up and explained what happened. 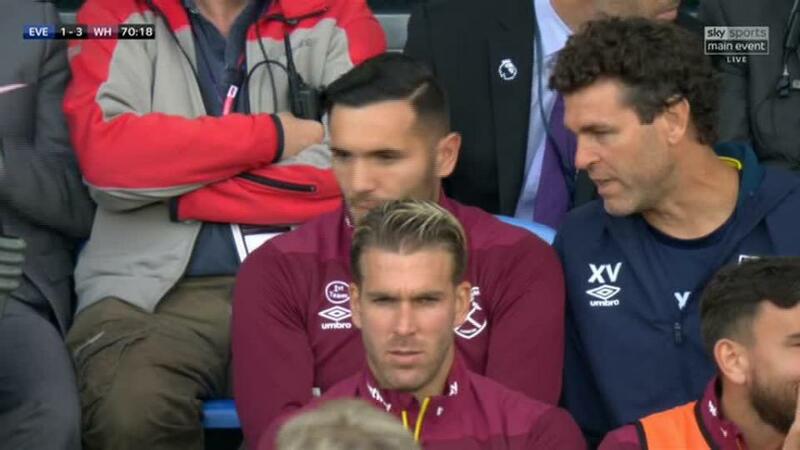 Pellegrini, who celebrated his 65th birthday with West Ham’s first win of the season, explained: “When Marko was injured, I called Lucas because he was doing a warm-up. “But then I saw he was sat on the bench and Antonio was working and ready, that’s why I brought him on instead, rather than waiting for Lucas to warm up again. Perez joined West Ham from Arsenal for £4million this summer. He has featured twice off the bench in the Premier League and started one EFL Cup game.